Are you new to the world of bookmaking? Would you like to try some new techniques or materials in your books? 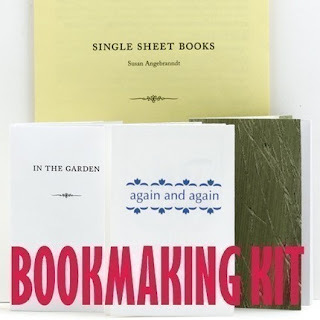 In this series of blog posts, I hope to connect you with some tutorials and kits written/created by members of the Bookbinding Etsy Street Team, to help both beginner and experienced bookmakers alike. Today we will begin with some simpler structures for those new to bookmaking. 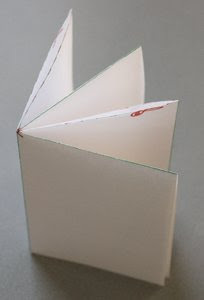 These folded books are generally quick and easy to make, and lots of fun! 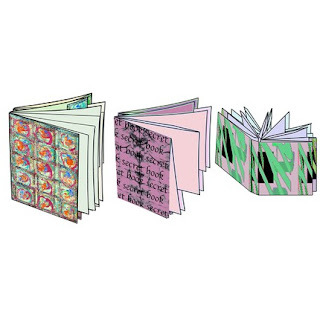 Susan, of greenchairpress, sells a kit with instructions to make 5 different books from a single sheet of paper! The kit also includes preprinted materials to make 3 books with these instructions, and a Word template for printing your own. Niko, of anagramforink, has written a tutorial on How to Make a One-Sheet Booklet, which is published on the HandMadeNews blog. Margaret, of marcadeartspress, sells several tutorials and kits for bookmaking. Her Beginners Bookbinding e-book Tutorial includes how to make a sewn pamplet and 2 folded books, including templates and printable cover designs. Happy folding and stay tuned for more ideas next week!